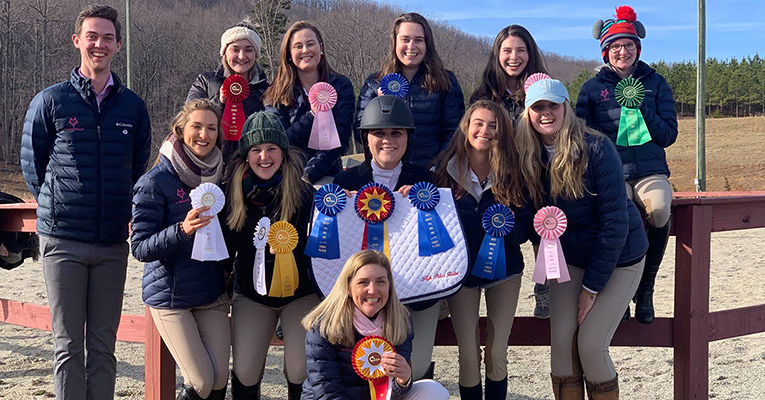 The Sweet Briar IHSA team earned Reserve Champion High Point Team laurels on Saturday at the Liberty University Equestrian Center, while sophomore Kaitlin Duecker qualified for regionals thanks to her strong performance on the day. Duecker (Chesapeake, Va.) won both novice fences and novice flat on Saturday. Duecker qualified for regionals in novice flat, while also finishing the day as the high-point rider. First-year Pauli Born won in walk, trot, while sophomore Hannah Inman (Monroe, Maine) picked up the blue ribbon in beginner walk, trot, canter. Junior Ailish Rhoades (Lebanon, Conn.) was fourth over open fences and fifth on open flat, while first-year Chloe Kerschl (Lexington, Va.) finished fifth on intermediate flat. Senior Taylor Jefferson finished fifth in walk, trot, while junior McKenzie Michiels (Mill Creek, Wash.) and first-year Abby Bell (Stafford, Va.) were fifth and sixth, respectively, in the walk, trot, canter. Sweet Briar concludes the regular season on Feb. 16 and 17 in an IHSA show hosted by Mary Washington at the A. Elizabeth Morrison Equestrian Center in Fredericksburg, Va.